Green Jackfruit – What is green Jackfruit? What are uses of Green Jackfruit? Green Jackfruit is unripe Jackfruit mostly used for cooking, roasting or baked. 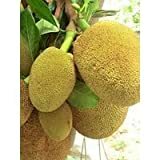 Jackfruit Artocarpus Heterophyllus Jack Fruit Seedling Plant Tree 8-13"